the topic of this weeks’ makeover is the Economic Freedom Index. 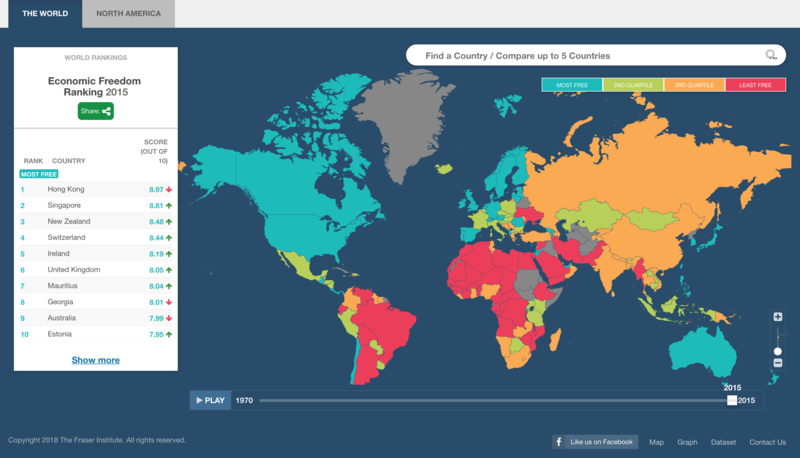 This index measures the economic freedom of almost every country in the world. Since its creation in 1970 almost every year, new countries have been added. The latest data of this data source is from 2015. What I dislike about the viz – In this case not much. Overall this is a clean and straightforward visualization. The index rating is split into 4 groups: “Most free”, “second quartile”, third quartile” and “least free”. The countries on the world map are colored according to this color legend. This is an explorative visualization, meaning insights have to be discovered on your own. However, it would have been nice to have some key findings pointed out. E.g. which country has improved the most, lost the most index points, etc. The additional table on the left only provides information about the ranking and the increase/decrease in points relative to the last measured index. The countries in the table are not colored according to their group (most free, etc.). To find out about the group you would have to cross-check on the map. I want to show which countries have gained and lost the most index points since the first measurement (1970). This one took me way longer than expected and I changed the message multiple times. My first table calculation which showed the difference between the Index value measured in 2015 and the first year of measurement didn’t return meaningful results. Georgia and Mauritius were the countries with the largest improvement. This is because some countries were not included in 1970 and were added in the following years. This would result in a very high improvement for some countries since their respective value in 2015 – 0 (value in 1970) obviously shows a larger gain in index points in comparison to countries which a have already been included in the index in 1970. Considering this, I created a set of countries which comprised only countries which already were included in the 1970 index. This shows a completely different picture. Two South American countries took very different turns. Chile, once far below Venezuela in economic freedom, has taken a big upsurge and overtaken Venezuela. Venezuela, on the other hand, was well above average in ECF as of 1970, but as of 2015, it lags far behind all other countries. I highlighted the countries Venezuela and Chile with bright colors and increased the bubble size. I added an average line for each year. Previous Previous post: MM CW 8 – Where do our Drugs and Medicine come from? Nils' Data Playground Blog at WordPress.com.